The India–Pakistan border skirmishes (2014–2015) were a series of armed skirmishes and firing exchanges between the Border Security Force and Pakistan Rangers along the Line of Control (LoC) in the disputed Kashmir region, as well as Punjab. Started from mid-July 2014, military officials and media reports of both countries gave different accounts of the incidents, each accusing the other of initiating the hostilities. The incident sparked outrage both in Pakistan and India and harsh reactions by the Indian and Pakistan armed forces and governments. Later in October 2014, the situation became aggressive, following which Indian Defence Minister Arun Jaitley urged Pakistan to stop "unprovoked" firing and warned that the response by India would be "unaffordable". His Pakistani counterpart, Khawaja Asif replied to the warning with subtle mention of "nuclear power" that the country would be able to respond "befittingly" to the "Indian aggression". On 12 October 2014, Pakistan's Foreign and National Security Adviser, Sartaj Aziz, sent a letter to UN and appealed to resolve the crises. However, the United Nations ignored Pakistan's proposal to intervene in the crisis and reiterated that the dispute be resolved through bilateral discussions. In September 2015, a delegation headed by DG Rangers Maj. Gen. Umer Farooq visited India for biannual talks and both sides agreed to stop ceasefire violations. The DG BSF, Devendra Kumar headed the Indian delegation. The Indian home minister Rajnath Singh told the Rangers delegation that "Indian forces will not fire the first bullet along the international border." Rangers delegation raised the issue of killing of a Rangers personnel called for a flag meeting by Indian BSF fire earlier. The DG BSF guaranteed that no such incident would occur in the future again. Both sides achieved consensus to conduct joint investigations if incidents occurred in the future and to further strengthen the border control. - In mid July one BSF soldier was killed after Pakistani Rangers fired upon Pittal border outpost along international border in Arnia forward area of R S Pura in Jammu district. – On 20 and 23 July, two civilians from Azad Kashmir were killed in Mirajke during a skirmish between Indian BSF and Pakistani forces. – Another incident occurred early August when an Indian soldier, allegedly trying to cross the border from Bajwat sector in Sialkot, was arrested by Pakistani Rangers. He was freed two days later on 8 August. – In late August, two civilians were allegedly killed by the Indian BSF in Sialkot region. – Early October, a 17-year-old girl was killed in alleged cross-border firing by Pakistani troops in Poonch district. Pakistani military official accused India of violating the ceasefire and opening fire in Pakistani village near Sialkot, after which Pakistani military retaliated. – On 6 October, Indian Border Security Forces (BSF) personnel fired along the working boundary in Sialkot, killing four. The Indian media reported death of 5 civilians in a ceasefire violation from Pakistan in Arnia belt of Jammu district. – The following day, one woman was killed in Charwah sector by Indian troops. and eight people were killed as Indian security forces allegedly fired and shelled a village the Chaprar Sector. Later that day, two women were killed as Pakistani troops targeted 50 security outposts along the LoC. – On 9 October, two Pakistani civilians were killed by Indian forces. Meanwhile, two Indian women were killed by Pakistani forces in an unrelated incident. – On 8 November, a civilian and a soldier were killed by Pakistani troops in Kamalkot area of Uri sector. – Pakistani officials detain a 13-year-old Indian student for mistakenly crossing the border before handing him over to Indian authorities at the Chakoti-Uri crossing point the next day. – On 20 November, a Pakistani soldier was killed by Indian troops in the Pandu sector near Muzaffarabad, Azad Kashmir. – On 30 December, Pakistani officials handed over 16-year-old girl to her family who had mistakenly crossed the Line of Control (LoC). – On 31 December, One BSF soldier was killed by Pakistani fire in Jammu & Kashmir's Samba sector. – On 31 December, Two Pakistan rangers, Naik Riaz Shakir and Lance Naik Muhammad Safdar were killed in Indian BSF firing at Shakargarh Sector of Narowal district. According to Pakistani sources, the soldiers were heading to participate in the flag-meeting when they were fired upon by BSF troops at Zero Point. The Pakistani officials also claimed that the BSF fired at those who went to rescue the injured soldiers too. The BSF officials claimed that the firing was in retaliation to the previous day's Pakistani firing and that five Pakistani soldiers were killed instead. – On 2 January, two Indian soldiers and one female civilian were killed by Pakistani army fire. The Hindu reported that 2 Pakistani Rangers were killed after 9:30 PM IST during the exchange. – On 5 January, Four civilians were killed by Indian firing and shelling on Pakistani residential areas, including 18 years old Azeem from Bore Chak and a woman from Sukhmal village in Zafarwal sector and two other civilians. Pakistani soldiers also responded by firing on BSF posts. – On 5 January, A BSF soldier was killed by Pakistani firing on BSF posts at Hiranagar in Samba sector of Jammu & Kashmir. – On 14 February, a sixty-year-old villager was killed by Indian fire in Rawalakot sector along the Line of Control. – On 11 April, Pakistani drone was claimed by BSF to be spying on Indian territory along the International Border. – On 1 May, a Pakistani civilian was killed by Indian BSF in Shakargarh sector. – On 30 May, Indian Police captured a Pakistani pigeon from Pathankot. The bird had Shakargarh and Narowal written on its body in English, along with some numbers and words in Urdu. Indian intelligence believed that the pigeon was being used for spying purposes. – On 5 July, a BSF soldier, was killed in cross border fire by Pakistani Rangers on 6 BSF outposts in Arnia sector near the Line of Control. – On 5 July, Indian Army handed back an 11 years old boy, Sameer Kayani, from Azad Kashmir, who had mistakenly crossed the Line of Control. – On 9 July, a BSF soldier, was killed by Pakistan Rangers fire at a BSF post in Baramulla sector. – On 11 July, Pakistan Rangers handed over the body of Kant Lal, from Jammu, who drowned in the river Chenab to the BSF. – On 15 July, one Indian civilian was killed by Pakistan Rangers firing on Kanachak and Bhalwal Bharath areas along International Border. – On 15 July, the Pakistan Army claimed to have shot down an Indian spy drone in Bhimber, Azad Kashmir. According to ISPR, the spy drone was being used for aerial photography. An official of the Indian Air Force denied the claim. A photo supplied by the Pakistani military appeared to show a Chinese-made DJI Phantom 3, said Huw Williams, an unmanned Systems Editor at IHS Jane's International Defence Review. "Due to its limited operating range — about two km — if the Indian military is using the system it would most likely be for close reconnaissance or security work," Williams said. Pakistan summoned the Indian high commissioner in Islamabad to raise the issue. On 27 July, the Pakistani ISPR released "some images and video clips" maintaining that the spy drone flew from an Indian post and entered into Pakistani territory, including the images of Indian ASCOM, an Indian soldier and aerial views of Indian Sector outposts and company headquarters along LOC. On the next day, India rejected the Pakistani claims, with the Indian Government sources claiming "India has dismissed the 'proof' furnished by Pakistan." – On 16 July, five Pakistani civilians were killed by Indian BSF fire at the Malana and Salehpur villages in Chaprar sector near Sialkot. – On 20 July, a team of the United Nations Military Observers Group in India and Pakistan visited the areas affected by cross border fire on the Sialkot working boundary. "The UNMOGIP visited areas most affected by recent Indian firing and were shown evidence of ceasefire violations," an ISPR statement said. The team flew by helicopter to the Pakistani side of the boundary; "The UNMOGIP observers visited Saleh Pur, Chaprar and Malane in Chaprar Sector near working boundary", the statement added, on Pakistan Army's request. – On 25 July, a Pakistani civilian, Mohammed Wasim, was killed by BSF fire at Polas village in Chirikot sector of Azad Kashmir. – On 30 July, an Indian soldier was killed in cross border fire by Pakistan Rangers at an Indian post in the Krishna Ghati sector in Poonch along LoC. – On 4 August, two Pakistani civilians were killed in BSF fire on Pakistani residential areas near Sukhial village along the Working Boundary near Sialkot. The killed included 14 years old Atif and 22 years old Muhammad Adnan. – On 4 August, one civilian was killed by Punjab Rangers fire at 12 BSF outposts in Kanachak and Pargwal sectors of Jammu district. – On 7 August, Indian toy bomb killed a child at Hillan Sector, Muzaffarabad. – On 9 August, a woman was critically injured by BSF fire on Pakistani residential areas in Jandrot sector along LOC. The 28 years old Fareeda belonged to Kotli, Azad Kashmir and was being treated in the Combined Military Hospital, Rawalpindi, where she died on 11 August. – On 14 August, the day of Independence of Pakistan, one woman, Muneera Akhtar, was killed by Indian army firing in Nezapir sector. – On 15 August, two civilians were killed in cross border firing along LoC in Kotli. – On 15 August, the day of Independence of India, 5 Indian civilians were killed in cross border firing along LoC. – On 16 August, a woman was killed by Punjab Rangers fire in Poonch district along LOC. – On 17 August, a woman was killed by Indian BSF fire in Nakyal sector along LOC. – On 18 August, one civilian was killed by Indian BSF fire in Nakial sector of Kotli district of Azad Kashmir. – On 21 August, United Nations observers visited the villages in Sucheetgarh and Charwah sectors along the Working Boundary hit by Indian shelling. – On 22 August, a 30 years old civilian was killed by Indian BSF fire in Batal Sector. – On 25 August, an Indian soldier was killed by Punjab Rangers fire along LoC in Nowgam sector. – On 28 August – 8 civilians were killed and another 50 were injured including 22 women by Indian BSF firing in Sialkot sectors of Pakistan. – On 28 August, three civilians were killed and sixteen injured along LoC by Punjab Rangers fire in RS pura sector. – On 29 August, United Nations observers visited for the third time the residential areas and villages affected by Indian shelling and fire. The observers visited the Kundanpur village in Sialkot and reviewed damage caused by Indian BSF fire. – The Indian fire on the Pakistani residential areas and villages displaced people from at least 50 villages in Sialkot, Pakistan. Three relief centres were established by the Pakistani district administration in Daallowali, Harpal-Balaarwali and Panur villages. According to district administration officials, fresh shelling and fire by BSF had affected at least 50,000 villagers while caused displacement of 40,000 of them. – On 7 September, an Indian civilian was killed by Punjab Rangers fire along LoC in Poonch sector. – On 11 September, the Pakistan Army handed over an Indian woman hailing from Nakarkot village in Poonch district to Indian authorities. She had mistakenly crossed LOC and entered Azad Kashmir at Chakoti Sector. – On 13 September, Chuni Sohan Lal, a BSF soldier was killed by Pakistan Rangers fire in Rajouri district along LOC. – On 15 September, Shams Khan, a Pakistan Rangers soldier from Gilgit-Baltistan, was killed by BSF firing in Azad Kashmir's Battal sector along LoC . – On 17 September, three civilians were killed by Indian firing aling LoC in Nakial sector of Azad Kashmir. – On 18 September, a civilian was killed by unmarked ship fire in Okha Coast, Gujarat. Some Indian media reports claimed that Pakistan Navy fired on the Indian boats. However, the reports of Pakistani fire could not be verified. – On 18 September, a 25-year-old woman was killed by Indian firing. – On 23 October, one civilian was killed by Pakistani rangers firing in Samba Sector. – On 26 October, two Pakistani civilians died by Indian BSF firing in Shakargarh sector. – On 2 November, two Indian Army soldiers were killed in Gurez sector, according to defence spokesperson. The Indian Prime Minister Narendra Modi said, "I want to assure the people that we will not let down our country" and 'everything will be fine soon'." While then Defence Minister of India, Manohar Parrikar said that, "If Pakistan persists with this adventurism, our forces will make the cost of this adventurism unaffordable". The Indian Home Minister, Rajnath Singh said that the Pakistan must stop ceasefire violations across the border, "times have changed in India". According to Indian claims, 18 militants were also killed and 19 alleged militant camps destroyed in October. In a rally in Multan, Pakistani politician Imran Khan stated that "Modi had been given a mandate by the Indian people, but if he chooses to use it for war, then I will regret it." Unofficial statement issued by the ISPR, Chairman joint chiefs General Rashad Mahmood reportedly marked that Narendra Modi is threat to peace and if he wants war then he will see just what the unified Pakistani military will do to India. On 12 October 2014, Pakistan's National Security Adviser (NSA), Sartaj Aziz, sent letter to UN and appealed to resolve the crises. However, the United Nations rejected Pakistan's proposal to intervene in the crisis and reiterated that the dispute be resolved through bilateral discussions. According to claim by the Director-General of Pakistan Rangers Major-General Tahir Javaid Khan, India fired close to 30,000 mortar rounds between 2010 and 2014. He also said Indian violation of ceasefire was up to the intensity of fighting a small-scale war. On 31 December, National Security Adviser Sartaj Aziz directed a letter through the Embassy of Pakistan, New Delhi, to External Minister Sushma Swaraj protesting the "breach of trust" over the killing of two Rangers personnel. In response to letter, External Minister Sushma Swaraj reportedly dismissed Pakistan allegations. On 28 August 2015, the chief of army staff General Raheel Sharif reportedly quoted, "Indian ceasefire violations, targeting of civilians is "highly unprofessional, unethical, irresponsible and cowardly." - On 9 October 2014, United Nations general secretary Ban Ki-moon's spokesperson issued a statement that he wants the both countries "to engage constructively to find a long-term solution for peace and stability in Kashmir". ^ a b Mateen Haider (12 October 2014). "Pakistan writes letter to UNSG over LOC violations by India". Dawn. Retrieved 12 October 2014. ^ a b Press Trust of India (14 October 2014). "United Nations ignores Pakistan bid to seek intervention on Kashmir dispute". The Indian Express. Retrieved 15 October 2014. ^ a b c "Pakistan, India agree to stop ceasefire violations at working boundary". The Express Tribune. 12 September 2015. Retrieved 12 September 2015. ^ "India won't fire first bullet along border, Rajnath Singh tells Pak Rangers". Times of India. 11 September 2015. Retrieved 12 September 2015. ^ "One BSF jawan dead, three injured in Pak firing". Time of India. ^ "One Pakistani killed, three wounded during Indo-Pak border clash". DAWN news. 21 July 2014. ^ "a man was killed in Mirajke after the Indian BSF and Pak Rangers allegedly opened fire". ExpressTribune. ^ "Militants kill 1 army jawan". Rediff.com. ^ "Pakistan freed captured indian soldier". ExpressTribune. ^ "Two Pakistanis killed, four Indians wounded in exchange of fire along border". DAWN news. ^ "two civilians killed by indian troop firing". ExpressTribune. ^ "Teenaged girl was killed by pakistani troops". Indian Express. ^ a b "Indian army violates ceasefire in Bedori sector". The Express Tribune. 3 October 2014. Retrieved 10 October 2014. ^ "India, Pakistan skirmish at LoC kills 9 civilians". Dawn.com. ^ a b "Ceasefire violation: Times have changed, Rajnath warns Pakistan". The Times of India. 7 October 2014. Retrieved 12 October 2014. ^ "1 woman killed, 2 injured as Indian army resorts to 'retaliation' in Charwa sector". ExpressTribune. ^ "8 people were killed in firing by indian security forces". ExpressTribune. ^ "2 killed in fresh Pak firing in J&K, India asks troops to retaliate strongly". Time of India. ^ "Two civilians were killed by indian army". Express Tribune. ^ "Pakistan continues to violate ceasefire, two women killed in overnight firing". ^ "indian force violate ceasefire again". ^ "Pakistan army violated ceasefire in arnia". ^ "J&K: Soldier, civilian dead as Pakistan violates ceasefire in Uri sector". m.ibnlive.com. ^ "Indian soldier killed in firing by Pak army". TimeofIndia. ^ "Pakistan returns boy who inadvertently crossed LoC". Nation. ^ "Pakistani soldier killed in fresh Kashmir firing: military". The Daily Star Lebanon. Retrieved 29 November 2014. ^ "Indian firing at LoC kills Pakistani soldier". ExpressTribune. ^ "Pakistan returns 16-year-old Kashmiri girl who strayed across LoC". indianexpress.com. ^ "Pak violates ceasefire in J&K's Samba, one BSF jawan killed in firing". TimeofIndia. ^ "Two Pakistani soldiers martyred in Indian firing at LoC". Daily Times. 31 December 2015. Retrieved 1 January 2015. ^ "Indian firing kills two Pakistani soldiers". The Nation. 1 January 2015. Retrieved 1 January 2015. ^ "Ceasefire violation: Two Pakistani border guards killed in Indian firing". The Express Tribune. 1 January 2015. Retrieved 1 January 2015. ^ "LoC violation: Unprovoked Indian firing injures two soldiers". dunyanews.tv. ^ "J&K: Pak rangers killed in retaliatory BSF firing". Times Of India. ^ "Pak desperate for talks with India after 5 Pak soldiers killed by Indian Army". Indian Express. ^ "Girl dies as India violates LoC ceasefire". ExpressTribune. ^ "1 civilian dead, several hurt as Pakistani troops target villages, border posts along IB". Hindustan Times. ^ "Pakistan firing kills 2 Army jawans, one woman; triggers migration". Indianxpress. ^ PTI. "BSF replies to Pakistan firing; 2 Rangers killed". The Hindu. Retrieved 24 January 2015. ^ "Ceasefire violation: Four civillians killed as Indian aggression shows no sign of abating". The Express Tribune. 5 January 2015. Retrieved 5 January 2015. ^ "Pakistani Rangers violate ceasefire again, kill BSF jawan". Times of India. 5 January 2015. Retrieved 5 January 2015. ^ "Indian shelling in Zafarwal, Shakargarh sectors kills 4 civilians, five Indian troops were also killed in exchange of fire". Nation.com. ^ "Rangers reciprocate Indian firing at LoC killing 5 soldiers". Dunya News. 5 January 2015. Retrieved 5 January 2015. ^ "60-years old man killed in indian firing". Dawn News. Archived from the original on 15 February 2015. ^ "Indian firing kills villager in AJK". The Nation. 14 February 2015. Archived from the original on 15 February 2015. Retrieved 15 February 2015. ^ "Pak drone spotted spying on Indian territory along IB in Rajasthan". India tv news. 11 April 2015. ^ "Pakistan lodges protest with India over killing of farmer near Working Boundary". Express Tribune. ^ "India nabs 'Pakistani pigeon' on spying fears". DAWN NEWS. ^ "Pakistan Violates Ceasefire Along LoC In Kashmir, BSF Man Killed". FocusNews.com. ^ "BSF man dies as India, Pak trade gunfire along Kashmir border". 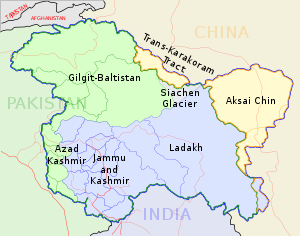 Greater Kashmir. 5 July 2015. Retrieved 5 July 2015. ^ "Pakistan violates ceasefire in J-K's Kupwara, BSF jawan killed". India Today. 5 July 2015. Retrieved 5 July 2015. ^ "Indian Army Hands Back Pakistani Boy Who Crossed LoC by Mistake". New Indian Express. ^ "BSF Jawan Killed in Pakistani Firing on LoC". New Indian Express. ^ "Pak violates ceasefire again, BSF jawan killed". IndiaToday.in. 9 July 2015. Retrieved 10 July 2015. ^ "BSF jawan killed in Pakistan firing". The Hindu. 9 July 2015. Retrieved 10 July 2015. ^ "IndiaOthers Pakistan Hands Over Drowned Civilian's Body To BSF". Focus News. 11 July 2015. Archived from the original on 11 July 2015. Retrieved 11 July 2015. ^ "Pakistan hands over drowned civilian's body to BSF". Business Standard. 11 July 2015. Retrieved 11 July 2015. ^ "Pakistani rangers injure 2 BSF jawans, kill 2 Indian civilians; BSF told to show restraint". The Economic Times. 15 July 2015. Archived from the original on 15 July 2015. Retrieved 15 July 2015. ^ "Pakistan kills one, injures five in mortar shelling along International Border". Indian Express. ^ "Pakistan military shoots down Indian 'spy drone'". Dawn News. ^ "Pakistan Army shoots down Indian 'spy drone'". Express Tribune. ^ "Pakistan says Indian 'spy drone' shot down, India denies". THE TIMES OF INDIA. ^ "Pakistan summons Indian High Commissioner over 'spy' drone, LoC ceasefire violation". First Spot. ^ "See What Pakistan Says 'Indian Drone' Saw". The Wall Street Journal. 28 July 2015. Archived from the original on 28 July 2015. Retrieved 28 July 2015. ^ "Press Release No PR213/2015". ISPR. 27 July 2015. Archived from the original on 28 July 2015. Retrieved 28 July 2015. ^ "Pakistan Army says drone shot down by soldier was flown from India". Pakistan Today. 27 July 2015. Retrieved 28 July 2015. ^ "India dismisses Pakistan's downed drone 'proof', says drone didn't belong to the country". IBN Live. 28 July 2015. Archived from the original on 28 July 2015. Retrieved 28 July 2015. ^ "Five killed in Indian BSF firing near Sialkot: ISPR". Express Tribune. ^ "Four civilians martyred in unprovoked Indian firing". The News. 16 July 2015. Archived from the original on 16 July 2015. Retrieved 16 July 2015. ^ "UN team visits LoC areas affected by Indian firing". The Express Tribune. 20 July 2015. Archived from the original on 20 July 2015. Retrieved 20 July 2015. ^ "Indian aggression: UN military observer group visits Working Boundary". Geo News. 20 July 2015. Archived from the original on 20 July 2015. Retrieved 20 July 2015. ^ "UN observers visit Sialkot working boundary". Dawn News. 20 July 2015. Archived from the original on 20 July 2015. Retrieved 20 July 2015. ^ "Army asks UNMOGIP to investigate Indian truce violations". Dawn News. 17 July 2015. Archived from the original on 20 July 2015. Retrieved 20 July 2015. ^ "Ceasefire violation: Man injured by Indian firing". The Express Tribune. 25 July 2015. Retrieved 26 July 2015. ^ "Indian firing at LoC injures one". Dawn News. 25 July 2015. Retrieved 26 July 2015. ^ "Pakistani troops kill jawan in fresh case of ceasefire violation". Indian Express. 30 July 2015. ^ "Sepoy killed in Pak firing". The Tribune. 31 July 2015. Retrieved 31 July 2015. ^ "Indian soldier killed in Kashmir cross border firing". Al Arabia. 30 July 2015. Retrieved 31 July 2015. ^ "Pakistan claims 2 killed in firing by Indian troops". Times of India. 4 August 2015. Archived from the original on 4 August 2015. Retrieved 4 August 2015. ^ "Two killed in Indian BSF firing near Sialkot: ISPR". The Express Tribune. 4 August 2015. Archived from the original on 4 August 2015. Retrieved 4 August 2015. ^ "Ceasefire violation: One killed as Pak Rangers target 17 BOPs, villages in Jammu". The Indian Express. 4 August 2015. Archived from the original on 4 August 2015. Retrieved 4 August 2015. ^ "Pakistan violates ceasefire again, one civilian killed". Hindustan Times. 4 August 2015. Archived from the original on 4 August 2015. Retrieved 4 August 2015. ^ "Indian toy bomb killed a child and injured two". The News Tribe. ^ "Woman critically injured by Indian firing". The Express Tribune. 10 August 2015. Archived from the original on 11 August 2015. Retrieved 11 August 2015. ^ "Pakistani woman injured by Indian cross-border firing dies at hospital". The News. 11 August 2015. Archived from the original on 11 August 2015. Retrieved 11 August 2015. ^ "Indian firing: Woman succumbs to injury at CMH Rawalpindi". The Frontoer Post. 11 August 2015. Archived from the original on 11 August 2015. Retrieved 11 August 2015. ^ "Indian firing across LoC kills one woman; husband, daughters injured". The News. 14 August 2015. ^ "Unprovoked Indian firing along LoC kills one, injures three: ISPR". Express Tribune. 15 August 2015. ^ "Indian envoy summoned for third time in a week". Express Tribune. ^ "On Independence Day, 3 civilians killed in Pakistani firing : Jammu and Kashmir, News – India Today". Indiatoday.intoday.in. Retrieved 15 August 2015. ^ "J-K: 1 more dead in Pakistan firing along LoC, toll rises to 6". Hindustan Times. 16 August 2015. Archived from the original on 17 August 2015. Retrieved 17 August 2015. ^ "Woman killed, eight injured in fresh Indian firing along LoC". Pakistan Today. 17 August 2015. Retrieved 17 August 2015. ^ "One killed, 3 civilians injured in latest LoC violations by Indian forces". Dunya News. 18 August 2015. ^ "UN observers visit shelling-hit villages". Dawn News. 21 August 2015. ^ "Another Pakistani martyred in Indian firing at LoC". ARY News. 22 August 2015. ^ "JCO killed in sniper fire from Pakistan at LoC". India Today. 25 August 2015. ^ "At least 11 killed as Indo-Pak border troops exchange fire". Dawn News. 28 August 2015. ^ "Six killed, 46 injured in Indian firing along Working Boundary in Sialkot". Express tribune. 28 August 2015. ^ "Indian firing on LoC kills 10 including woman, child". The Nation. 28 August 2015. ^ "Pakistani troops violate ceasefire again in RS Pura sector; 3 civilians killed, 16 injured". Times of India. 28 August 2015. ^ "UN team visits Sialkot village to observe damages caused by Indian firing". Pakistan Today. 29 August 2015. Retrieved 1 September 2015. ^ "Three relief centres for villagers hit by Indian shelling". Dawn News. 1 September 2015. Archived from the original on 1 September 2015. Retrieved 1 September 2015. ^ "Civilian killed in unprovoked firing by Pakistani troops along LoC". Indian Express. 7 September 2015. ^ "Pakistan Army hands over Indian woman who 'inadvertently' crossed border". The Express Tribune. 11 September 2015. Retrieved 11 September 2015. ^ "BSF officer killed in Pakistani firing". Business Standard. 13 September 2015. Retrieved 13 September 2015. ^ "Pakistan violates ceasefire again, 1 BSF officer killed in firing in Rajouri". Indian Express. 13 September 2015. Retrieved 13 September 2015. ^ "Army soldier killed in Indian firing along LoC". Express Tribune. 15 September 2015. ^ "Unprovoked Indian firing kills two civilians along LoC". Express Tribune. 17 September 2015. ^ "Indian fire kills three civilians at LoC". The Nation. ^ a b "One Killed as Unmarked Ship Fires at Indian Fishing Boat Off Gujarat Coast". NDTV. 18 September 2015. Retrieved 18 September 2015. ^ "Indian fisherman allegedly killed in Pakistan firing off Gujarat coast". Indian Express. 18 September 2015. ^ "Pakistan navy kills Indian fisherman off Gujarat coast". Times of India. 18 September 2015. ^ "Woman die, three injured in Indian firing along LoC". ARY News. 18 September 2015. ^ "Pakistan provokes India again, kills labourer on International Border". DNA India. 23 October 2015. ^ "Unprovoked aggression: Indian border forces kill two Pakistanis". The Express Tribune. 26 October 2015. ^ "J-K: Two jawans killed as Pakistan violates ceasefire ahead of Modi's visit". The Indian Express. 3 November 2015. ^ "Pakistan to pay "unaffordable" price for Kashmir firing: Arun Jaitley". The Economic Times. 9 October 2014. Retrieved 12 October 2014. ^ "Pak violates ceasefire again; PM Modi says 'everything will be fine soon'". The Times of India. 8 October 2014. Retrieved 12 October 2014. ^ "India, Pakistan Signal Possible Escalation of Hostilities". The Wall Street Journal. 9 October 2014. Retrieved 12 October 2014. ^ "Jaitley warns Pakistan, Modi praises troops as ceasefire violations continue". The Indian Express. 10 October 2014. Retrieved 12 October 2014. ^ "Rajnath takes strong exception to ceasefire violations by Pakistan". Dailyexcelsior. 6 October 2014. Retrieved 12 October 2014. ^ "18 terrorists killed in infiltration bid". The Times of India. 8 October 2014. Retrieved 20 October 2014. ^ "Army razes 19 terrorist camps in PoK". The Free Press Journal. 18 October 2014. Retrieved 20 October 2014. ^ "Will not accept India's domineering in the region, says Nisar". Dawn. 10 October 2014. Retrieved 10 October 2014. ^ "Kashmir Conflict LIVE: Fresh Ceasefire Violation by Pak After Day-long Lull; 1 Civilian Injured". International Business Times. 6 October 2014. Retrieved 12 October 2014. ^ "Military Action, Diplomatic Threats Between India and Pakistan in Kashmir". 10 October 2014. Retrieved 12 October 2014. ^ "Islamabad's dark warning to India as defence minister hints at nuclear response". 10 October 2014. Retrieved 12 October 2014. ^ a b "India fighting small-scale war with Pakistan: DG Rangers Punjab". Retrieved 24 January 2015. ^ Mitra, Devirupa (3 January 2015). "Sartaj Aziz Writes to Sushma, Protests Killing of Rangers". The New Indian Express, 2015. The New Indian Express. Retrieved 6 January 2015. ^ staff writer (3 January 2015). "Sushma Swaraj writes to Sartaj Aziz; dismisses Pakistan allegations". Economic Times, India, 2015. Economic Times, India. Retrieved 6 January 2015. ^ "Army chief slams India's 'cowardly' ceasefire violations". Express Tribune. 28 August 2015. ^ "India and Pakistan trade blame over shelling across disputed Kashmir border". Washington Post. 9 October 2014. Retrieved 12 October 2014. ^ "UN chief Ban Ki-moon asks India, Pakistan to resolve issues through dialogue". The Economic Times. 9 October 2014. Retrieved 12 October 2014.